61,000g A&D Industrial Balance, 0.1g Readability - Gilson Co. 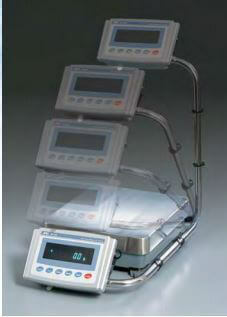 The AD-61KA A&D Industrial High Capacity Balance offers a high-capacity solution precise enough for laboratory use. This 61,000g (134lb) capacity balance has a 0.1g (0.0002lb) readability and a 13.5 x 15.1in (344 x 384mm) stainless steel weighing platform. 12" Sieve, All Stainless, Intermediate Height, 1-3/4"
12" Sieve, All Stainless, Intermediate Height, 1-1/4"
8" Sieve, All Stainless, Full Height, 3/8"
8" Sieve, All Stainless, Full Height, 2-1/2"
8" Sieve, All Stainless, Full Height, 1-1/2"